What have I gotten myself into this time? While I painstakingly redo my lawn for the second time in a year, my wise Master Gardener friend tilled hers up for the last time, replacing it with a carpet of dwarf mondo grass, never having to mow again. Granted, she’s worked mighty hard to prep the soil, divide the dozen or so flats of mondo grass into hundreds of smaller plugs and then plant them into the ground, one by one. And while all that was going on, I was tilling raking, tilling, grading, raking, liming, fertilizing, seeding, raking, smoothing and watering. We both invested several days in our respective lawn makeover projects. The difference is, her work is just about finished – for good, while mine is only beginning. I say that because maintaining a traditional lawn is the most labor intensive part of any landscape. And yet most of you, like me, are unwilling to give them up. Although I can say that each year, I reduce the size a little, I doubt I’ll ever totally give it up. Excuse the stereotype but I’m a guy. I like lawns. My Master Gardener friend has never liked lawns. In fact, she’s gone so far as to say she hates them as it is only fair since they hate her. Until now, she’s had a small island of grass but I think that was more to appease her husband than anything else. Then one day recently he offers to till the lawn up so she can plant mondo grass. Hold on there mister! Have you crossed the line? You were the only fighting chance we had to show that the man of the house still had some say there, albeit a rather paltry plot if I do say so myself. Now, who’s going to know that you even live there; you keep your truck in the garage! And yet, with age comes wisdom. Although only slightly older than me, I believe they’ve seen the light. The dwarf mondo grass they have replaced their lawn with (Ophiopogon japonicus ‘Nana’) will be beautiful when established. Better yet, it maintains a deep green color all year, is undemanding as to soil type, could care less about being watered, thrives in sun or shade, requires no fertilization, is disease resistant and never requires mowing. Yes, lawns are beautiful too, at their peak. 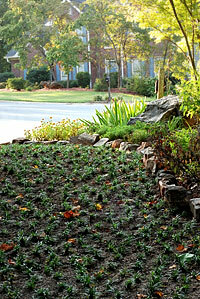 But with traditional grass lawns, the maintenance requirements are much greater. First, there’s the lawnmower to keep it at that all-important proper height. 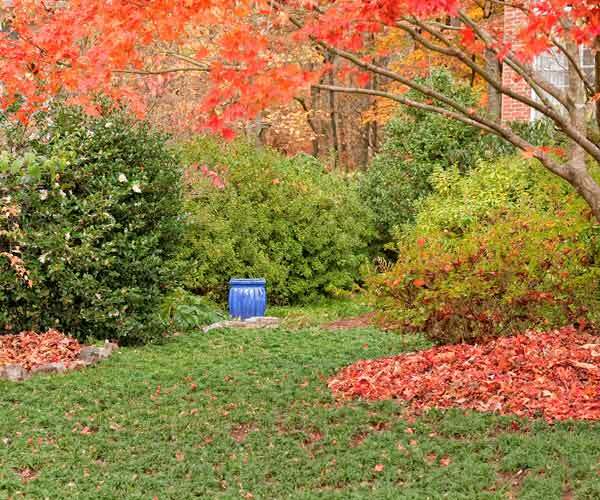 Of course, you’ll need fertilizer, pre-emergent, post-emergent, insecticide, fungicide, an irrigation system and plenty of water and time to maintain it all. Then there’s the ever-encroaching tree canopy that shades the lawn, causing it to thin out. This is further exacerbated by the thirsty root mass competing with the grass for water and nutrients. Not realizing the true problem, we instinctively go out and buy more sod or seed, throw down extra fertilizer and water even more. 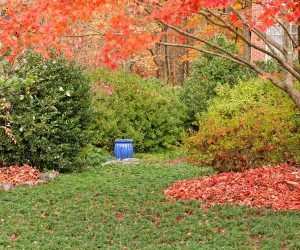 It helps the lawn look better for a while, but the trees really love it and respond like obedient dogs, expanding their canopies and stretching their roots even more. Indeed, it is a vicious cycle and one we rarely concede – unless of course you’re like my friends, the wise Master Gardener and her husband. I’m learning. In fact, intellectually, I know all these things and have for some time. I no longer attempt to grow grass in shade, I use corn gluten as an organic preemergent and I water only when necessary. I grass cycle, returning my clippings to the soil, reducing total nitrogen needs by about 30%. In spite of doing all the right things, frankly my traditional fescue lawn is a nutrient and water hog that demands more time, attention and chemicals than it deserves to look its best. Maybe some day I’ll be like my wise Master Gardener friend. But for now, I don’t have time to think about it. I’ve got to get back outside and check on the grass. Great idea using only mondo grass. I am not going to replant my dead grass. Here, in Stuart, we have mostly sand making maintaining grass a big problem, plus the shortage of water makes me feel guilty every time I water. So off I go to get more mondo grass.